Field Report November 30, 2011 Jeff Sundin Okay, the pace is starting to pick up in the area. Ice is beginning to form around Deer River and points North and the fishing reports are starting to trickle in again. There are a few spots in the area where anxious anglers are already fishing, and with over night temps in the teens, there will be a few new spots freezing up every day. Okay, now listen, don't go rushing out there without using some common sense! It's okay to burn up a few brain cells by doing some extra thinking, if it means that you'll be coming back off the ice dry and safe. On Tuesday, heading South on our road trip to the Walleye Advisory Council Meeting, we travelled past some of the popular Central Minnesota Lakes where ice was starting to form over a week ago. Now, the water was wide open on all but the very shallowest and most protected waters. MilleLacs had some thin sheets and chunks of ice floating in the water, but nowhere was there any sign of an ice covered bay. There were a few small ponds that still had ice cover, and some of the shallower lakes did too, but for the most part, the trip South took us past mostly open water. The Walleye Advisory Meeting didn't set any records in the category of new accomplishments. The time was spent reviewing some of the Walleye stocking data, discussing the effectivenss of Walleye Stamp marketing and sales efforts and as usual, we re-covered a bunch of old ground, making the meeting more of a history lesson, than a work in progress. One issue that stands out, is the debate about how to slow down the spread of invasive species, most important at the moment, the Zerbra Mussel. According to reports by some of the DNR experts, we still have a little time to figure out what to do about lakes where they're already present. But everyone agrees, preventing the spread to other non-infested waters is and should be the top priority. How to do that, is going to consume a lot of hours and some of the conversations aren't going to be too fun, but these nasty little critters are the enemy, and we're going to have to dig in and figure out some solutions, even if they're painful. For me, I'm going to commit myself to learning the best and fastest ways to "de-contaminate" my boat and trailer. That and letting you know how to do it is really all I can do, but it's a start. I'm going to keep slipping in little snippets of information as it becomes available, and if you take a little time, learn about a few lakes that are infested, you'll feel a lot better about rolling up your sleeves and pitching in. (11/30) On Lake of the Woods, Jackie LaValla at Sportsman's Lodge said "We lost the ice on the lake that had formed, but Four Mile Bay (our access to the lake in the winter) and the Rainy River in front of the lodge still have a few inches of ice. The channel in the bay and river has opened up, but we have continued to freeze at night. We know it won't be long and we will be shivering again". (11/30) In Deer River, I got a text from my pal, Bill Powell letting me know that he was opening Fred's Bait in Deer River for business today. Bill said that he had a crew stop in on Tuesday to pick up some Sucker Minnows and that they had reported good action using tip-ups for Northern Pike on one of the smaller, Deer River area lakes. He had also, gotten a heads up from the folks at Dixon Lake Resort, North of Lake Winnie. They said that there were about 3 inches of ice on the Third River Flowage and told Bill that they'd be trying to get a few dark houses on the ice for the upcoming weekend. (11/30) On Red Lake, I have seen some pictures of a friend, with his portable shelter and 4 nice Walleyes on the ice. I am waiting for permission to use the picture(s) and I'll update the report as soon as I can. From what I can see, the ice along shore is "walkable" but there was no sign of any atv's, tracks or any other kind of vehicle out on the ice. For now, don't plan on going up there unless you plan on hoofing it, close to shore. (11/30) On Lake Winnie, John Seekon at The Pines Resort emailed a note saying "As of today the main lake is ice free, but tamarack bay is about half froze over. We are waiting for cooler temperatures so we can see some major ice formation all over the lake." (11/30) On Leech Lake, A report from Ron at Anderson's Horsehoe Bay Lodge In his own words; "The SW side of Leech had some ice on it last week. The warm weather and waves broke it up, and it opened up again. Our harbor was frozen some time ago, not much ice but enough to cover the top. Most of if melted and broke up this past week. Last night there was little wind, and cold temps. There is a sheet of ice on the harbor & the main lake up towards Grassy Point. It will be a couple of weeks before Leech is fishable. I heard some of the smaller lakes have ice & Portables are out on Garfield Lake over by Laporte. Also, Birch Lake over in Hackensack has 4" of ice. Over off of Hwy #64 south, is the Gulch Lake Campground. This has Nelson, LakeTwentyOne, Bass Lakes. These are frozen over right now. 3-4" on them. Lake Twenty One & Nelson Lake are the best for fishing. These are state forest areas. So yesterday, Ten Mile Lake was open, Leech was open. 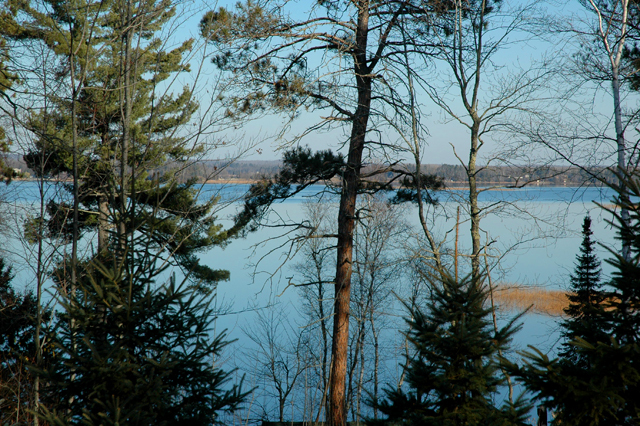 Drove to Brainerd yesterday, Round Lake was open, North Long had ice on it. Gull was open." Horsehoe Bay Lodge is open for the winter and they're running some specials. December Hotel Special: Any Hotel Room $99 per night. Stay for 3 or more nights at $79 per night Includes up to 4 people Taxes not included. 12-01-11 Attention Lodge Owners, Rental Operators and fishing guides, it's time to update the fishing reports page! As the winter season arrives, there will be lots of folks checking for news about ice conditions and winter lodging. Email your update or inquire about advertising here. Field Report November 29, 2011 Jeff Sundin If you've been waiting for news about the great Northern Minnesota ice conditions, I hate to disappoint you, but Monday was a lot better day for getting rid of ice, than it was for making ice. Hey, for me, that was great because I needed a day with a little sunshine and there will be plenty of winter without begging for more! It's beginning to look like most of this weeks fishing news is going to be made inside, not outside. Today, I'm on the road early with one of my fishing colleauges, heading for the Walleye Advisory Committee Meeting with the Minnesota DNR. Then, I'll be working for a couple of days on the the Ice Fishing pages for the website. Friday, it's time to head toward the Twin Cities for the St. Paul Ice Fishing Show, where I'll spend the weekend in the Lindy Booth. If you're in a hurry to get out on the ice, the good news is that temperatures are predicted to remain below freezing for the rest of this week. Not a lot, but enough to move conditions in your direction. Field Report November 28, 2011 Jeff Sundin On Sunday, temperatures stayed at or near the freezing mark around the Deer River area. In terms of the ice cover, not much was gained, nor lost. Small, shallow lakes remain ice covered, but most of the larger lakes that froze last week have opened back up. Now we're waiting for a do-over as soon as the temps fall again. For me, the extra time gives me a chance to work on an article for the ice fishing section as well as get the ice page ready to open up on Thursday. (11/28) On Lake Winnie, I got a note and picture from Nick Perkkio who has been chomping at the bit to get out ice fishing. He's been using his time wisely, building himself a new ice shelter. He delivered it to the South shoreline of Lake Winnie this weekend and discovered that all of the ice that formed last week, had been broken back up by the wind and waves. It's gonna be a little while, but he's ready when it freezes back up! (11/28) On Lake Vermillion, Erik at Bayview Lodge says that the main lake had frozen, but warmer weather over the holiday weekend opened most of it back up. 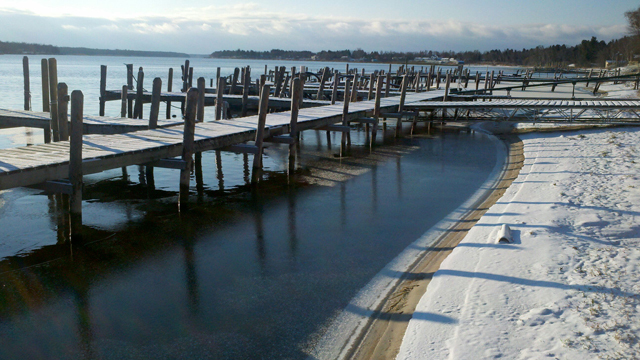 Pike Bay, along with several other shallow, proted bays remain frozen. All of the landings and boat ramps are frozen, so for anglers, there's not much to do but wait for the next cold snap. (11/28) On Bowstring Lake, Mike Collins dropped me a note to say that the ice held up over much of the lake. He reported that most of the lake remains ice covered except for some holes on the South end. Mike said that the nearby, deeper, Jessie and Little Jessie Lakes are both still open. Field Report November 27, 2011 Jeff Sundin Mixed snow and rain, Grey skies and soggy feet made saturday a quiet day around the Deer River area. Hoping for dry conditions, some of our plans got put on hold until today. Inside barn chores a few small yard projects and a bunch of cooking topped the list of accomplishments for me. For fishermen, this is another day to add to your waiting list for ice. Conditions are just too warm for making much new ice and with the rain and wet snow falling for most of the day yesterday, we probably even lost a little more ice. The incoming weather looks good for getting us back into ice making territory, even now it's 28 degrees and predicted highs for today are 32 degrees, so we're already on the right track. Field Report November 26, 2011 Jeff Sundin We are going backwards! The overnight conditions have been wet, soggy and warmer than average. Ice on area lakes remains, but continues to get softer as warm conditions persist. Today, the forecast is for freezing rain, turning to snow at mid morning. Not exactly ice making weather and neither is the forecast for the rest of the week. it's beginning to look like the "sure thing" of having ice to fish on before December 1st, is getting to be more of a gamble all of the time. On Friday, most of our visitors headed back home. Lucky for me that I still had a couple of enlisted helpers hanging around the house! We got a lot of outside chores finished up, fixed the barn roof, moved in the firewood, worked on the chicken coop and cleaned up the barn a little. After all of that, I and Austin thought it might be nice to take another swing at those Geese that have been driving me nuts all week long. We already knew that these critters had the decoy gig all figured out, so we weren't going to even try and get them to decoy. But we finally figured out how to use that information. This time, we took the decoys out and put them where we didn't want the Geese to land. Then instead of putting our blinds near the decoys, we put them a couple of hundred yards away, hoping that they'd avoid the decoys and land in the open field instead. Guess what? We liked that plan! There weren't a ton of chances, but we had enough action to make it fun. Today, it's going to be tough to squeeze everything in. 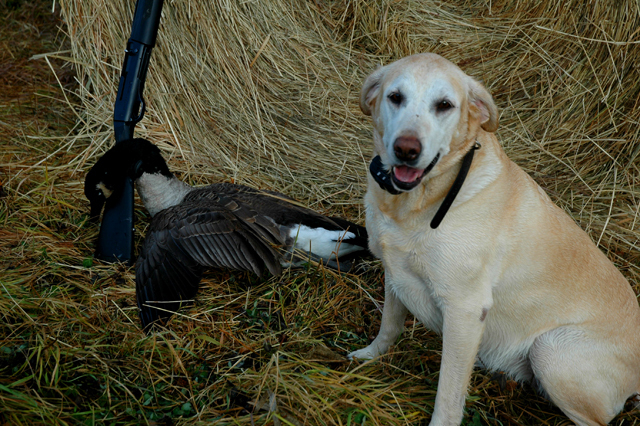 We'd like to try tyhe Geese one more time, but we still need to take some of the chickens for their last walk, and then there's the muzzleloader season opening today. Hmmm..., hard to tell where I'll wind up. I guess it's going to be another one of those "on the grid - off the grid" days around here. We better talk about the ice for a minute, there are still a few reports lingering around out there about guys that have been out on the ice. Remember that these reports came in during that really cold snap last week and if anything, the ice has deteriorated every day since then. Be extra careful when you're sizing up a potential fishing spot and don't go out unless you're convinced that there's enough ice under you. I'm as anxious as anyone, but not enough to take an un-planned plunge into the lake. Field Report November 25, 2011 Jeff Sundin Well, it's the day after Thanksgiving and yesterday, I spent more time cooking than watching the ice conditions. But, we did get out for a little while and from what I can see, We still have most of the ice that formed before the warm up. The ice doesn't look as solid as it was, but it hasn't begun to melt. Right now, the air temperature is 28 degrees so it probably firmed up again over night, but with forecasts of mid 30 degree weather, I don't expect that we'll see much new ice during the early part of this week. There are reports of some anglers out on the ice is isolated places, fishing or spearing on ice ranging from 2-1/2 to 4 inches thick. Doesn't sound real safe to begin with, but now, I'd say it's downright dangerous. The snow that fell in open fields, roads and ditches has all melted. Snow in shady, forested areas or in tall grass is still hanging in there, but a lot of that is gone now too. There are still a lot of Geese in the area and in spite of their ability to out smart me earlier this week, I think we're going to take one more swing at them this afternoon. Tomorrow, the muzzleloader Deer season opens and I'll be taking the opportunities as they come along to try and get one last Deer for the freezer. Throughout the day today, I'll be out and about and if there's a big change, I'll drop in a few notes this evening. Field Report November 23, 2011 Jeff Sundin On Tuesday, ice conditions in the Deer River area remained stable, but with temperatures creeping up above the freezing mark, there wasn't a lot of new ice forming. I had planned a driving tour of the area to check ice conditions, but changed my game plan when the forecast of even higher temperatures sort of helped take the urgency out of the project. We never needed to head out anyway, because some of my friends covered the same ground I was going to check out. On Tuesday, ice conditions in the Deer River area remained stable, but with temperatures creeping up above the freezing mark, there wasn't a lot of new ice forming. (11/23) On Lake Winnie and Cutfoot Sioux Bill Powell from Fred's Bait took a look at the lake and at first glance, said that it like there was more ice, than open water. His impression changed as he arrived at a resort that was up on higher ground and from there, he could see a lot of open water out toward the center of the lake. (11/23) On Cass Lake, Jason Green from UPNORTH, sanapped some pictures as he moved West on Highway 2. He said that the bay was frozen nearly all the way out to Stony Point. Still lots of open water out on the main lake. (11/23) On Lake of the Woods, Ice is reported to be about 2-1/2 inches thick in the area near Adrian's. Field Report November 22, 2011 Jeff Sundin Conditions in the Deer River area remained icy on Monday as winter continues to push it's way toward us. Another full day of temperatures below freezing allowed ice to continue forming throughout the day. A mild warming trend is predicted for the next few days, but it looks like it might warm up just enough to slow down the progress. It doesn't look like it will warm enough for any melting to occur. One bit of good news is that the lions share of the snow that fell this past weekend, missed us and most of the water, open or frozen has one good chance to freeze without all of the snow cover we had last year. It might be kind of nice to have decent travel conditions for a change. I stopped in at River Rat Bait and talked with Ken Roy, who said that he doubted that there would be enough ice, or enough interest to get folks out there for this up-coming Thanksgiving weekend. He agreed with me though, that it's looking fairly certain that there will be some opportunities by the first weekend in December. I'll be taking a driving tour of some larger lakes today and let you know how things are looking on Lake Winnie, Cass Lake and the North end of Leech Lake. Field Report November 21, 2011 Jeff Sundin Ice fishing for Thanksgiving? Oh man! The system that's covered the Itasca Area with a layer of air temperatures in the low teens, has kick started the ice machine and area lakes are freezing up fast right now. After an un-eventful morning sit in the Deer stand on Sunday, I took a short ride Northeast of Deer River to see how the ice was forming. I expected to find some, but my first stop at Little Bowstring Lake revealed a lake that was already 90% ice-covered. I tried walking a few steps from the boat ramp, but the ice was only an inch think and started craking instantly. Another stop at Island Lake, where I discovered 100% ice coverage. It looked like Island had just frozen over night, there were large areas of shiny, smooth ice, the kind you want to go home and get the skates for. On my way home, I swung back into the landing at Chase Lake. The deeper lake is holding it's temperature and while the ice around the edges is growing, the lake is still almost completely open. There were a few scattered flocks of Geese floating in the bay near the landing, probably the same ones that I see in my front yard. Checking my email this morning; Mike Collins checked in with a report that Bowstring Lake iced over last night. 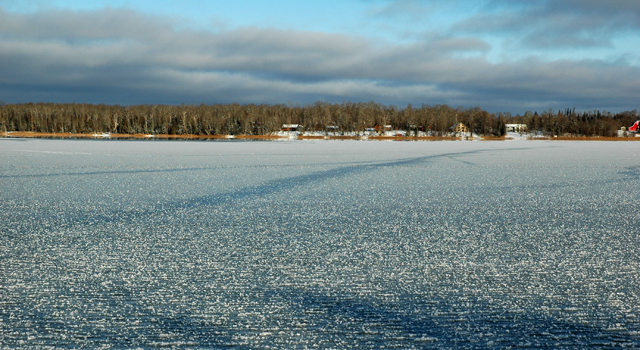 Another message from JR in the Cass Lake area said that Kitchi Lake was now frozen as well. From here, you can connect the dots, with another cold night and daytime highs in the mid 20's, there will be ice making all day long again today. Listen, we're a little bit away from knowing where the best ice will be, and I am not telling you to go ice fishing next weekend, but I do remember times that I have ice fished on Thanksgiving weekend, just saying. Wrapping up the firearms Deer season and the last of of my 16 days of freedom, was a quiet experience for me. It was nice, sunny and calm, but really cold out there. 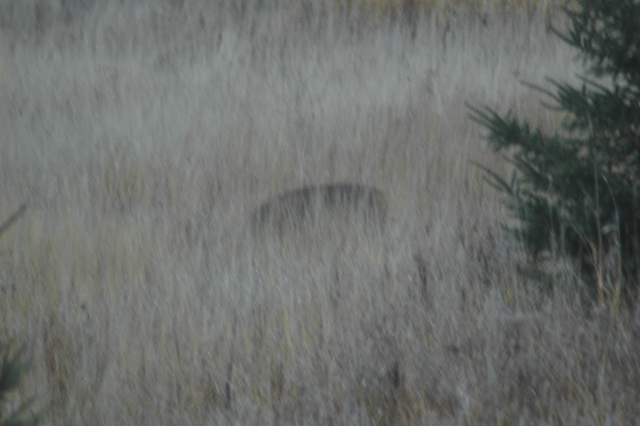 I never spotted a Deer during either the moring or afternoon hunts, but I waited it out until the last second. We managed to fill 2 of 3 tags and with the Muzzle Loader season still to come, the third one is probably still to come. First, full time domestic for a week! Still working on the house, getting ready for Thanksgiving and putting away all of the gear that I've left laying in one spot or another. Paint brush in one hand, roasting pan in the other, time flies when you're having fun. Field Report November 20, 2011 Jeff Sundin The last day of the Deer season and the weather is tracking straight toward first ice. Today, I'll be taking advantage of my last chance to sit in the stand and I'm hoping for a chance to correct a huge mistake I made on Tursday. After the morning hunt, I'll be doing a quick tour of the area to see how the ice looks an on a few of the area lakes. Right now, we're a little bit ahead of where we were last year at this time, but not a lot. It looks like after mid-week, we might be getting a warming trend. That could slow down the process, but I doubt that we'll lose any ice that's already formed. There will be a major update before Thanksgiving just to keep everyone up to speed about the long weekend. If you've been watching your favorite lake freeze up, email me with your report and I'll include it in the update. 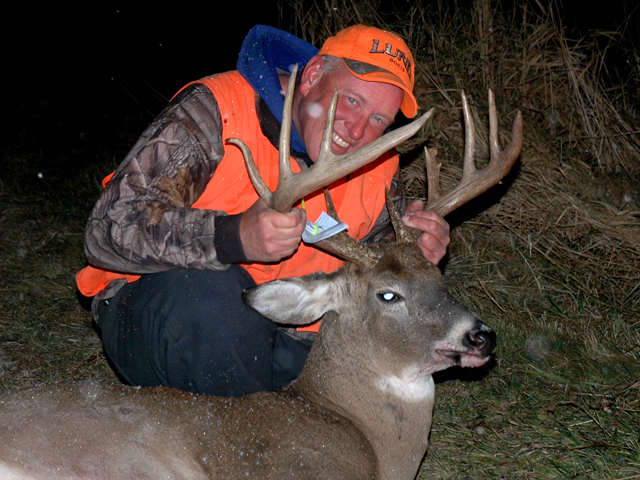 Field Report November 18, 2011 Jeff Sundin Well, if you heard Thursday's Morning Show on KAXE, then you heard me tell everyone that the last Thursday of the Deer season is usually my scheduled day to bag a nice buck. There I was, minding my own business, completely happy to be getting some pictures of a few does that have been keeping their eyes on me lately. Suddenly, they jumped and one of them looked back, as if to say oh oh, look who dropped by. Well, it was another member of the Mr. Big family and I just had to ..... So just when I thought I was finished butchering, the fillet knives are back on the agenda for today. This buck got even with me though, he made it into the swamp before dropping and I got my chance for a workout. 200 yards to pull out a 200 pound Deer doesn't sound too far, but if you drop by, I'll show you how it can turn into a really long, wet walk! Hey, just to celebrate, I got home, stopped and took a nice deep whiff of the good air, then I had a few sips of "the good stuff". Then I got back to work! Ice conditions around the Deer River area didn't change a lot yesterday, but it never warmed above freezing. So all of the ice that's formed so far, is still with us and more is on the way. Reports are now beginning to trickle in from around Northern Minnesota and the ice fishing season is almost up on us. The ice fishing page is scheduled to go up on December 1st and I'd guess there will be fish photos on that page by December 2nd. (11/18) On Lake Winnie and Cutfoot Sioux Bryan Harris, Eagle Nest Lodge said that there's no sign of ice there yet either, but he added "The water has that thick, steely look like it wants to go soon". (11/18) On Ball Club Lake, Gus Sheker says, "Ice is forming in the harbor during some of the colder evenings, but melting during the sunny days. We maybe as long as 4 weeks away from having safe WALK out ice to begin the ice fishing season. Our lake conditions will be updated as conditions change. Field Report November 17, 2011 Jeff Sundin The first ice of the season is cropping up on many of the Deer River area lakes. On Wednesday, I found several shallow ponds that are frozen completely, along with a handful of lakes that have some shoreline ice forming. With temperatures hovering in the mid 20 degree range, it's time to start the countdown. If the current forecast holds true, we'll be looking at a lot of ice by Thanksgiving, yes, that's next week! There are some reports starting to trickle in from around the area and within the next week, I'll post anything that looks like news. For right now, the rule of thumb is that small bays and isolated shorelines are beginning to freeze. So far, there are no reports of major lakes wihin striking distance of Deer River freezing up. 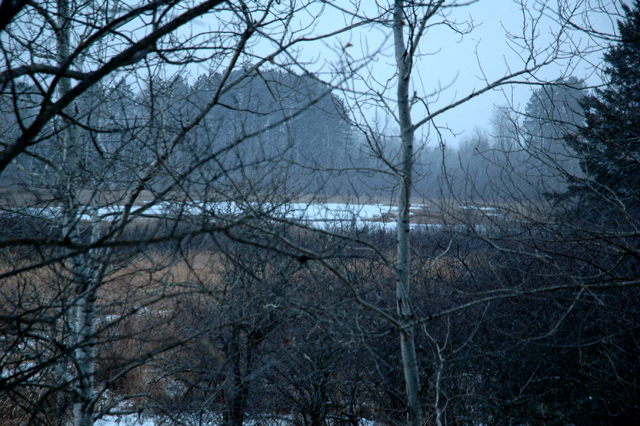 Field Report November 16, 2011 Jeff Sundin In Deer River, MN The seasons first snowfall arrived on Tuesday and while it didn't amount to much, it did set the stage for a new mood around the Itasca area. If you're like me, loving the fall and wishing it would last forever, then this is a good time to start the countdown to the spring fishing opener. Which for me, could be in as little as about 135 days, depending on when the Rainy River opens up next spring. In the meantime, there is this other thing, what was that again, oh yeah, Ice Fishing. Of course, that would be a great way to spend some time! In fact, now is a good time to start gathering up all of your gear and moving it toward the main exit. With Thanksgiving only a week away, the ice-fishing season could be hot and heavy within just a few weeks! Ice report for 11-16-2011 - White Oak Lake, South of Deer River has about 1 inch of ice covering the main bay. Toward the river channel, there is still open water. 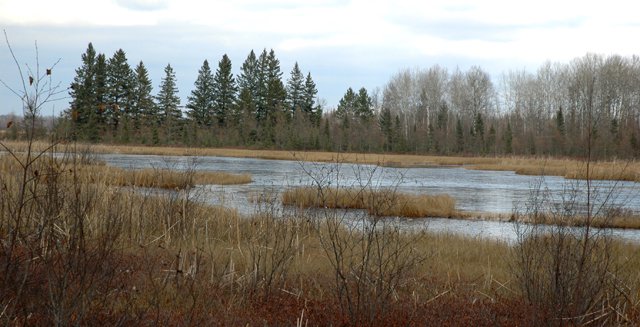 Most small ponds are covered with an inch or so of ice too, but many have pockets of open water near areas of darker vegetation or flowing springs. Field Report November 15, 2011 Jeff Sundin In Deer River, MN The ice machine continues to get close, but moving at a snails pace. Right now, the outside air temperature is 32 degrees and there are thunderstorms with rain and snow mixed for today. I'm sure there won't be too many new shallow spots freezing this morning. With most all of the lakes still wide open. It's going to take a serious cold snap to The forecast for the rest of the week appears to be a little cooler, but mostly more of the same. High daytime temps in the high 20 degree range should keep water that freezes from opening back up, but it won't make much new ice on the larger lakes. Acoording to Mike Kinsella at Border View Lodge on Lake of the Woods, surface temperatures on the main lake are now at about 37 degrees. It won't take much though, the action will be hot and heavy on the big lake within a month! A slow news week for fishermen will end later this week when a tour of the area to visit with lodge owners and rental operators will set the stage for the ice season. Next week I'll begin posting daily ice-condition updates and pictures. Field Report November 14, 2011 Jeff Sundin In Deer River, MN Sunday was Deer hunting day again and except for not seeing any Deer, it was a fantastic day! I was focused on the field where I've seen a deer or two on almost every trip out, but today they were absent. Luckily, there was a lot of action going on with my resident Eagle that was working on it's nest again. It looks like there are big plans for that location come springtime. The one day that I left my camera at home, was the day that I had the most opportunities for a great photo. 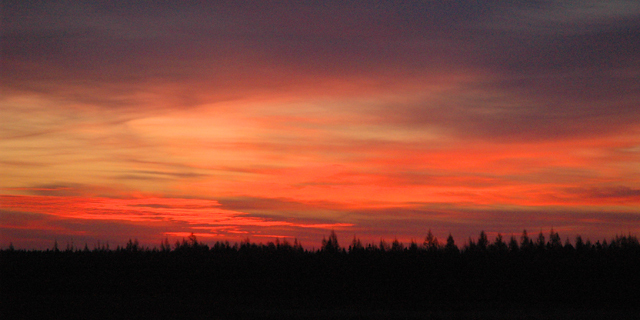 It doesn't matter though, even without the photo, I still have wonderful images from that morning session in my stand. The Deer Hunting season in the Itasca area continues to be slow, but steady. Around Deer River, reports are trickling in about friends that are filling their tags. Some of the more experienced hunters say that the full moon was working against them, some blamed slow action the windy conditions over the opener. For me, a new wrinkle cropped up on Sunday. After I spent the morning in the stand without a sighting, I returned in the afternoon expecting to at least see a couple of fawns that had been visiting almost every evening. This time, no visit at all, hmm... that's odd. Just before the end of legal shooting hours, I could hear what sounded like dogs barking. The barking turned into howling and at one point, muffled by distance, wind and woods, I swear that I could hear the sounds of a kill going on. If the Wolves are back into our area, then it will be slow from here on out, but we'll see how it goes. Around the Deer River area, it was mostly Grey. The absolute picture of a typical November day, winter pushing closer, fall dropping behind. Temperatures are hovering close to ice making temperature, but not quite cold enough to get the larger lakes freezing. The smaller ponds and really shallow lakes are giving in though and it's easy to find patches of frozen water in the area. Field Report November 13, 2011 Jeff Sundin In Deer River, MN Hold Everything! Arriving In Deer River on Friday was this nice looking flock of Geese. I had it in mind to skip the morning Deer hunt on Saturday and set up a few decoys in the corn field instead. 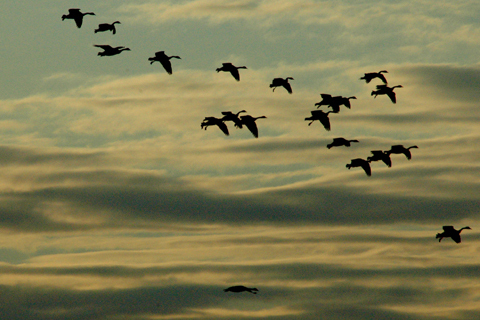 On Friday, the Geese landed in the field at 7:45 AM so I knew I better get a good early start. The strategy was perfect, I got everything set to go in the wee hours of morning and then I made my way out to the field. 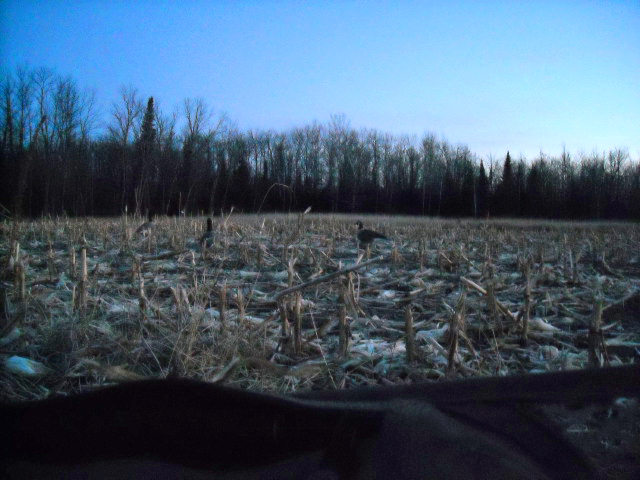 First I set the decoys, then I made sure I had the blind was weeded in perfectly. 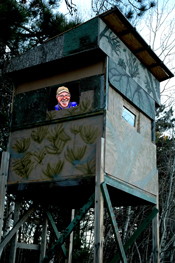 I climbed into the blind at 6:45 and waited until 7:45, 8:15, 8:45 and finally decided, they're not coming. I didn't want to fall behind on my Multi-Tasking, so I headed back to the house and started working on my barn door. At 9:30 I heard a racket and walked around to see what was going on. Oh come on, it was the Geese leaving the field! Somehow they came in and did their thing within a half hour after I left. As Fred Flintstone would say, "Sicka-Fracka-Frickus-Sickkus"! After that little episode, I took a little drive down to the landing at White Oak Lake where I spotted a trail of broken ice heading out toward the river channel. I looks like the lake is about 2/3 ice covered now and with the weather forecast for cooler temperatures this week, I'd say we'll be looking at ice on a handful of these smaller, shallower lakes by next weekend. 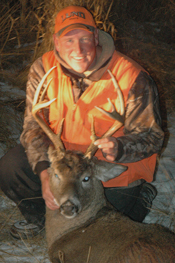 Field Report November 12, 2011 Jeff Sundin In Deer River, MN Friday was a better day for doing chores around the house than it was for hunting. I'm not quite sure if it was the warm, sunny afternoon, or the dump truck hauling in and out of the gravel pit, or if it was the guy who pulled up in the blue truck at 4:15 and started hoofing it past my stand, or maybe if the Deer just weren't in the mood. No matter what caused it, the afternoon hunt fizzled out before it got started and so now it's back to the drawing board for the weekend. 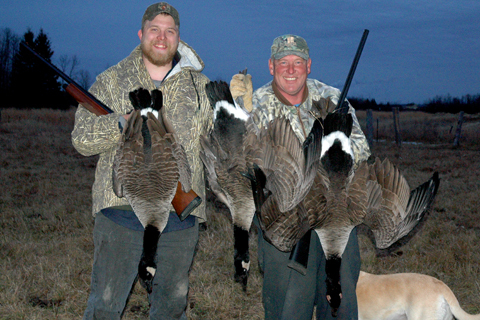 I had been hearing a few rumors that the cold temperatures were forcing some Ducks and Geese down from Up North. As luck would have it, one flock of Geese came into a nearby Cornfield yesterday and I think I'll see if I can't figure out a way to take advantage of that sometime this morning, like right now! Later, the afternoon Deer hunt is on the agenda and hopefully there will be a little more ( or less, depending on how you look at it )going on today. Field Report November 11, 2011 Jeff Sundin In Deer River, colder weather has started freezing the surface of smaller ponds and larger lakes are sporting surface temperatures in the high 30 degree range. It won't take too much cold weather to reach the tipping point. On Wednesday evening, we got our first dusting of snow and with more calm, cold weather on the way, I think that I'd start moving my ice fishing gear toward the main door. I'm still in the combination of hunting, remodling and general domestic mode, but I'm looking for a chance to get the boat in the water one more time. The weather is supposed to take a turn for the better this weekend and it may last into early next week. I've been hearing rumors that there are a few Walleye anglers fishing on the Rainy River and that some larger fish have begun moving. So far, I haven't heard of anything over 10 pounds, but it sounds like some fish in the 6 to 8 pound range are being caught. If you're not a Deer Hunter or if you're already finished for the season, Saturday might be an opportunity. Field Report November 10, 2011 Jeff Sundin In Deer River, colder weather has started freezing the surface of smaller ponds and larger lakes are sporting surface temperatures in the high 30 degree range. It won't take too much cold weather to reach the tipping point. On Wednesday evening, we got our first dusting of snow and with more calm, cold weather on the way, I think that I'd start moving my ice fishing gear toward the main door. A sure sign of the freeze up, has been the flocks of Swans that I've seen heading South over the past few days. They've been moving through in flocks of anywhere from just a few, up to flocks of 30 or 40 at a time. There aren't too many Ducks or Geese in the area, so apparently most of them have already made their move. I'm hoping to make good on one promise though, I'd like to get Bill Powell in on one, decent Goldeneye hunt before the season grinds to an end. Maybe, that's gonna give an excuse to through the boat in the lake one last time too. On Wednesday, I took advantage of the opportunity to show off just a little bit. The hunt for Mr. Big ended late Wednesday afternoon, when on my 10th visit to the deer stand, he finally made an appearance at the wrong time, ( for him ). Luckily, I didn't mess up the shot too bad because when he bolted, he was heading for a thousand acres of floating bog in a Black Spruce swamp. I was lucky again to find a little blood on a trail, through the tall yellow grass and with the help of the Chief Ramrod, Arne Danielson, we found him before it got too late. The hunt isn't over just yet, we're still working on a couple more for the freezer, but I think I'll take the morning off and finish the painting that got set aside last evening. Fishing Report November 9, 2011 Jeff Sundin The temperatures overnight fell back down into the 20 degree range. Yesterday, there were several small ponds that were iced over 75% or more. This morning, I'm sure that these, along with some more will have frozen over night. You know that I haven't been getting a ton of fishing reports from friends just lately, but I did get one yesterday from my buddy Vern Valliant who led his crew on the chase for Walleyes on Lake of the Woods this past weekend. Fishing Report November 8, 2011 Jeff Sundin The wind finally let up and the cloud cover disappeared early last evening. I wish that there was some way that I could have shown you how wonderful the moonrise was! I've seen rainbows around the sun a bunch of times, but not too often around the Moon, I did the best I could with my camera, someday I'll do even better. Today, I'm going to squeeze in a little Deer Hunting, but I'm also going to be working on the transition from open water fishing to the Ice Fishing pages. 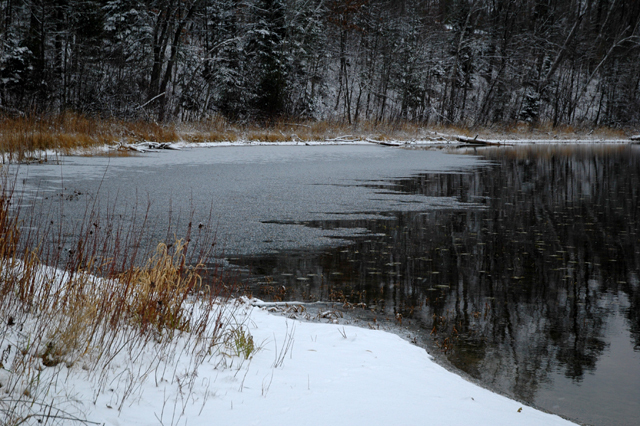 With an overnight low of 19 degrees in Deer River, it won't be too long before the smaller ponds start freezing. (11/8) On Lake of the Woods, Vern says; "Instead of chasing deer this past weekend we did our annual trip to Rainy River. Except this time we fished the lake instead of the river. The wind was not too bad on Saturday on the south shore of Lake of the Woods. We started out in front of light house gap in 21' - 25' of water and were only able to catch small saugers and walleyes with the exception of only a couple bigger fish. We made the move over to Morris Point Gap and after a few moves we stumbled into a school of nicer fish. Mostly saugers with an occasional nice keeper walleye mixed in. We were in 26' feet of water. Around 1:30 pm the wind went down some and the sun was shinning so we decided to head out to the nine footer and try some rocks. This turned out to be a good move. After searching around the edges with the Hummingbird we found some fish on the transition in 32'-33' of water. Here we anchored up and caught very nice keeper walleyes and a few slot fish along with some very nice saugers. We finished out the day there. No big Lake of the Woods bruiser walleyes but fish up to 22". Maybe if we had some more time to sniff around the edges of the rocks? Water temps started at 43 degrees in the morning and was 44 when we pulled the boat out. We anchored and fished vertically using jigs with live and frozen emerald shiners. Log Cabin Bait had plenty of minnows. Jig color did not seem to matter as long as it had some gold on it. We caught around 70 fish for the day. Not many boats fishing the river. I would guess as long as the wind stays out of the south the bite should hold up until it freezes. Looking like a real good start to the ice fishing season up that way." Fishing Report November 7, 2011 Jeff Sundin Only two days into the Deer season and I've already seen a few, that's way ahead of average for me! By the way, to the guy with the truck and trailer, who was clanging around behind the Deer River Sportsmen's Club at 5:10 PM yesterday, Thanks Pal! No, I didn't mind watching them run away like scared Chickens! It gives me a reason to keep hunting. Don't worry about the rest of us, as long as you're happy, we'll all be fine. In spite of the heavy, heavy winds, the Deer did move around a little and there was more shooting (in our neighborhood) than we'd heard all day long on Saturday. A few friends have reported sighting Bucks and we saw a nice little spike Buck on our way to the farm yesterday. Hey, it was really good to be sitting out there with that nice, optimistic feeling! Another nice development for me is the appearance of what seems to be my own "pet Eagle"! For the past couple of days, I've been watching the bird land in the Cattails and come back out with pieces of material that it takes back into the White Pine Tree behind my stand. Looks like I won't get too bored while I'm waiting for MISTER BIG to appear. I can't imagine that very many anglers were out in the wind yesterday, in fact, I am almost convinced that my boat is going to be put away for the winter. IBut if the weather changes, ....... we'll see. I will do a brief update about fishing any time there are reports coming in. But soon, all of the focus will be on the up-coming ice fishing season. In the meantime, you have a safe and happy hunt this weekend and drop me a line if something really cool happens! Fishing Report November 6, 2011 Jeff Sundin One day into the Minnesota Deer Season Opener, and I am still waiting for my first sighting. Super windy conditions didn't boost my confidence too much, but a few of my friends did see some Deer, so there's reason to be optimistic. I'll be spending today in the stand again and it looks like another windy one. I'll be checking in with updates about fishing and lake conditions as they come in and throughout the week, I'll be making the transition over to the ice fishing season. I know ... but really, there's going to be ice on the lakes in just a few weeks! Fishing Report November 4, 2011 Jeff Sundin The Minnesota Deer Season Opener is tomorrow and it's going to over-shadow the fishing for a few days. I'm off the water for the weekend and I'll be working at the rifle range all day long on Friday helping with the big rush of folks from around the state, that will be heading into the area. If you're looking forward to the deer opener, but still haven't sighted in your own rifle, The Itasca Gun Club sight in event continues until 5:00 PM on Friday. For $3.00 a gun you get great place to shoot and assistance from some really knowledgeable folks. Follow this link to learn more. There are still folks out fishing on a few of the lakes and rivers in Northern Minnesota, so there won't be a total blackout. I'll pass on the reports I get over the next several days. For now, fishing in the area is holding up really well because the un-seasonably warm, October temperatures have kept water temperatures from plumetting. Right now, you can still find mid-40 degree water temperatures on most of the area lakes and on a few of the deeper, colder ones, there are even some high 40's hanging in there. If the colder, wetter weather comes in as predicted though, we might be looking at the end of the open water season for 2011. Until that happens, here are some reports from folks who have been out and about. (11/3) On The Rainy River, Walleye fishing is generally good and most of the Walleye fishermen are reporting limits of "keeper size fish". There are a few of the larger ones starting to trickle in now and every day, someone picks up a fish in the 7 to 9 pound range. The Shiners have already been in the river for a couple of weeks, but the Walleyes stayed out on the big lake, where Walleye anglers, helped by the relative light Southerly winds, have enjoyed great success. (11/3) On Lake of the Woods, Walleye fishing on the South end has been great. Anglers are still picking up easy limits of eater size fish in the 20 foot depth ranges. At even, there is a run of fish in shallower fish too and you'll fing them in the 8 to 12 foot range just beore dark. Jig and minnow combinations are perfect, just adjust your weight to the depth you're fishing. (11/2) On Leech Lake, Walleye fishing is steady, at least in a few of the popular locations. Sugar, Battle, Stony, Hardwood and Pine Points were mentioned as good Walleye spots during the past week. The jig and minnow bite is fair in the 8 to 12 foot depth range. Walleyes are reported to be a little sluggish, they'll bite, but you need to nurse them on to the hook. Try to set the hook too fast and they just escape with the minnow. Perch are still semi-active in the deeper weeds at the North end of Portage Bay in the 10 to 13 foot range. There haven't been a lot of folks out there fishing them, but those who have are still catching some of those Jumbos that have been hitting since September. Jig and minnow combinations will be perfect for the Perch. (11/2) On Cutfoot Sioux, Walleye fishing has never really caught fire this fall, but it is better now than it was a couple of weeks ago. 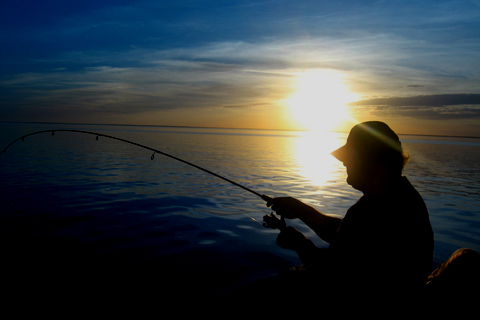 Expect to find better action during the evening than during daylight, but some of the popular spots will produce fish during the daytime as well. Crappies have migrated into the deepest water and can now be found anywhere from 30 to 34 feet deep. The action is okay, fish are sluggish but catchable. When you can find a small school or pack of fish, hover over them and fish vertically just above the school. At times, these fish have spread out horizontally along the bottom and can be spotted as singles and doubles. Troll slowly and work a jig and minnow combination within a few feet of the bottom. You'll pick up some of the more active fish by moving continuously. Fishing Report November 1, 2011 Jeff Sundin Northern Minnesota Anglers don't get a ton of chances to fish into the Deer hunting season, but just maybe this year is going to be a little different. On Monday, we wrapped up the month of October with a nice day and a nice bag of fish to boot. We followed up on a hot tip, that didn't turn out to be too hot (this time), but it really was worth a try, especially since I'd had some really good fishing on the lake earlier this year. I knew that I might just be over-anxious, so I had set a time limit of noon and if the fish weren't cooperative, we had planned to head for another "lunker lake". I cut the time limit short because by 11:00 AM we could see that the fish were suspended out over deep water instead of up on structure. After we decided to move, we took another look at whether we wanted to fish for lunkers or action. This time the decision was to skip the lunker hunt and go for some action instead. We packed up the truck and headed back to where I'd fished on Sunday, hoping that the fish were still cooperative. This time, we arrived to a little surprise, whitecaps coming up from the South end of the main lake gave me more to think about as we chose our first spot. It was one of those winds that didn't quite line up with the structure. It was fishable, but it just always kept me half way turned around and the boat did some unusual self-induced maneuvers. That aside, we managed well enough and soon figured out that the fish were still cooperative. On the first spot, we caught a half dozen fish in the 19 to 21 inch range, no whoppers, but nice. The action for keeper size fish, under the 17 inch protected slot size, was tricky though and by the time we moved from here, we only had 2 "keepers" in the cooler. The second stop turned out the same way, lots of fish up to about 20 inches, with many of them just midway between 17 and 18 inches. Not many eaters, but it was fun, so we stuck around for a while. Finally we left this spot and when we did, we were still only up to 5 keepers in the cooler. Our last stop is where we fishined out the evening. A narrow rocky point that extended out from shore, surrounded by weeds on both sides. At first, it didn't look too promising, a few Perch and a couple of bite-offs by scissor bills. Toward the tip of the point though, we started getting a few Walleye strikes. The first few fish were hard to catch and sluggish biters. But as the sun started dropping, the fish became more aggressive and the eveing bite produced another dozen fish, this time with a heavier balance toward the keep size fish. We wrapped up with ten keepers in the cooler, not quite our limit, but a nice finish to the day. Again, the presentation was jig and minnow combinations in the 8 to 18 foot range. Rocks produced the most fish, by far, but weeds produced the lion's share of the keepers. Perch and Pike were close to the weeds too and for a multi-action bite, fishing the weedline would be the way to go. (November 2011 has come and gone. Lucky for us, memories last a lot longer than dates on the calendar!) Smiles last forever and are always welcome! Are you smiling? I AM :) !! Ah Ha! We got you that time! After scratching my head for a week about how to trick these Geese, Austin Jones and I finally came up with a plan. Island Lake North of Deer River. Frozen with shiny, clear ice that will soon be perfect for skating. Little Bowstring Lake North of Deer River was 90% ice-covered on sunday. Unusual, tall but narrow rack on this older eleven pointer. 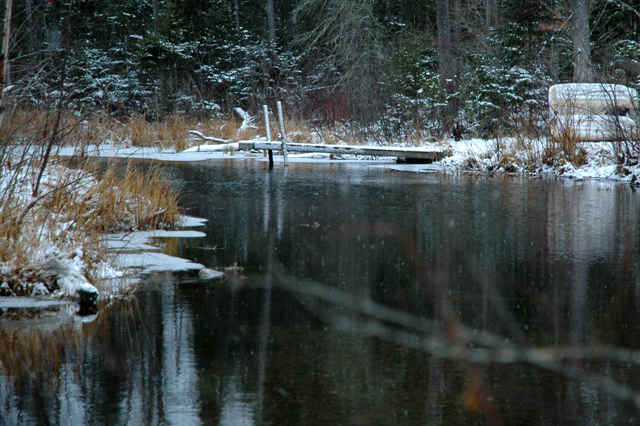 Smaller, protected ponds like this one (above) are freezing up fast. Chase Lake, near Deer River (below) showed the first signs of shoreline ice on Wednesday. 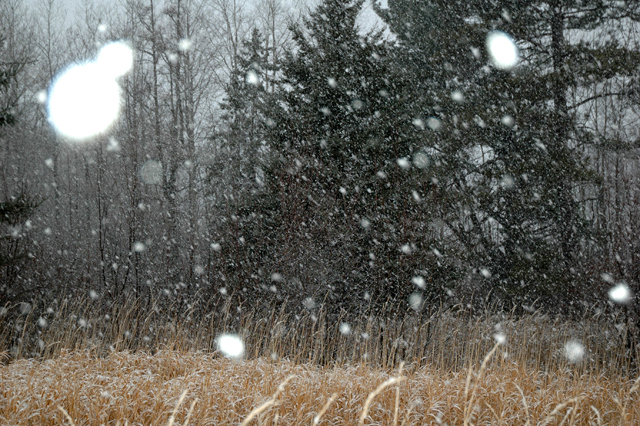 Deer River received it's first snowfall of the season on Tuesday (11-15). There are still a handful of Geese hanging around and luckily, some of them were using a nearby corn field. All set up and ready to go, now where are the Geese? 8:00 AM, now where are the Geese? On their way into a nearby Corn field on Friday, these critters are going to cause a slight interruption in the Deer Season! I over heard someone grumbling about not seeing anything, Hmmm... the grass is tall this year and the Deer are well hidden! Maybe there's one or two you've missed? Colder weather has started freezing the surface of smaller ponds. Ice up on the large, shallow lakes isn't too far behind! The hunt for Mr. Big ended late Wednesday afternoon! Hey, not bad for a fisherman! I did have to use the Musky Pole though! :) !! After three days of windy, Grey weather, calm and sunny is a welcome break! Wonder if the Smallies are hitting? I did the best I could with my camera, someday I'll do even better. Click on image to enlarge. If you're not out there, you can't see stuff like this! Okay then, see ya out there! Not as nice as the TajMahol, but it should be a comfortable place to sit for today! Good luck on the Deer Opener!